1. Heat the oil in a frying pan and fry the baby vegetables for 3-4 minutes. Add the crème fraîche, 1 tbsp water and the mustard, and cook for 1-2 minutes. 2. Meanwhile, poach the egg in boiling water for 2-3 minutes according to taste. 3. 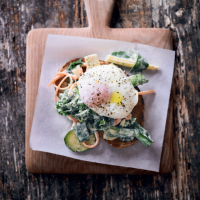 Spoon the vegetables onto the toast, top with the egg and season with pepper.